Can Young Sheldon Carry the Ratings Once Big Bang Theory is Gone? The question on a few minds at this point isn’t really whether or not Young Sheldon can carry on once The Big Bang Theory is gone. It’s more along the lines of, ‘why is it still here?’. Now before anyone gets up in arms about that statement let’s take a close look at the show and the idea that it was meant to take over once TBBT was gone. We all know that the original show was never going to last forever, but Young Sheldon is a show that has the expectation of being able to bridge the gap between the two of them as Sheldon being a child should be able to grow into Sheldon the man, without changing much more than his appearance, and therefore complete the tale. But there are a few problems with that when it comes to a TV show, and there’s a lot that has to do with the fact that people do get tired eventually of seeing the same idea rolled out like a wad of pizza dough on a cutting board. Eventually that wad gets a little too thin and can’t hold the weight of the expectations. Yeah the analogy might be a bit tired and kind of obscure, but it does make sense. Here are a few reasons why Young Sheldon might not be able to carry the torch once The Big Bang Theory is gone. Sheldon is a popular character, but it’s partly because he has great supporting characters. For some people Sheldon is a constant annoyance since the character is quite honestly unable to interact on a social level with almost anyone. The moment he tries he becomes insanely awkward and resorts to thinking he’s superior to everyone in the room, a quality that only his close friends seem to be able to put up with. But the character is still loved by a lot of people, though if anyone’s being honest it’s because of those people that surround him. Young Sheldon has this as well, but the problem here is that the show still needs to build enough interest in said characters for the series to really gain the kind of attention that TBBT did. In other words Young Sheldon is loaded with a fair amount of potential but it could sputter and fail before it really takes hold. Too many people are still enamored of TBBT to really get emotionally invested in another show that has different actors and characters. The Big Bang Theory was loved for the first couple of seasons before its numbers started going down. Throughout the history of the show TBBT did encounter dips and high points in the ratings and acted accordingly to make the show a little more interesting. 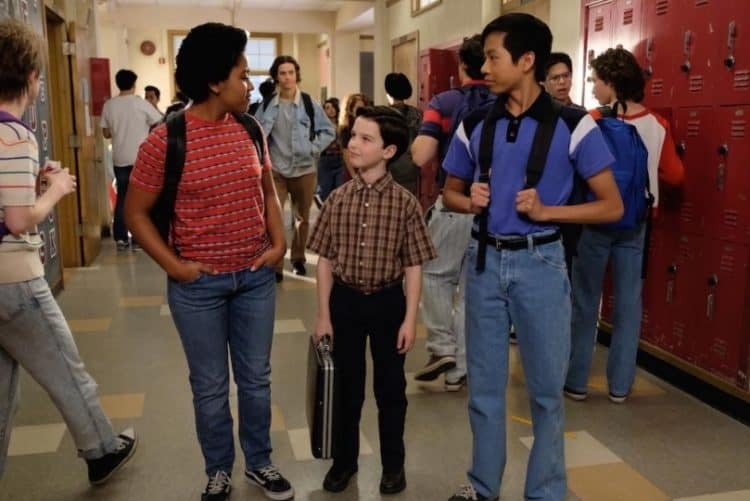 Young Sheldon gained a great deal of hype mostly because it was about the most conspicuous character in the show and because it seemed to be a belief that he could carry his own weight without anyone else. So far this hasn’t really been proven since there haven’t been as many people raving about the show as they did when TBBT first came out. This is the problem with follow-up shows, they don’t typically inspire anyone to jump ship once their favorite shows are over and simply pick up again. It takes time to really enjoy a show and become so emotionally invested in it that you’ll watch it even when a bad episode comes one. Every show has experienced this a time or two in their history, and TBBT is no exception. Unfortunately if Young Sheldon wants to attract the same number of viewers in its time the producers will have to come up with a way to really get people interested when Young Sheldon is all alone without the original show. There’s a big hope that Young Sheldon will have enough weight on its own to hang tough since TBBT is over and done with and it now has to stand on its own wobbly legs. But right now it’s about as uncertain as Sheldon might be in a game of dodgeball, there’s always a chance it’ll pull through but it could be that the ratings might dip so much that the show will take a proverbial smack to the face and be down for the count. Some people would like to see this just to preserve the love they had for TBBT, while others would like to see if the show could actually go the distance and bridge the gap between the two programs. Personally it doesn’t seem likely, but there’s always a chance since a lot of people are into origin stories these days, and that’s pretty much what Young Sheldon is, an annoying origin story about an annoying kid that is just too smart for his own good at times.